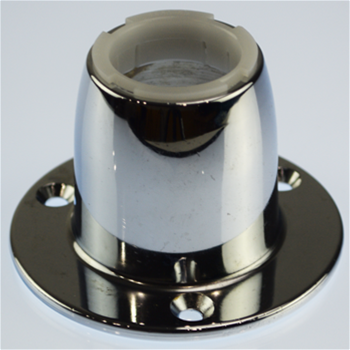 If you need parts for a lazy susan, OVIS stocks a large selection of Rev-A-Shelf lazy susan replacement parts for quick shipment to get your repair project completed quickly. Less common replacement parts can also be special ordered. We do not stock parts for the Rev-A-Shelf Value Line, or Lazy Daisy brands. 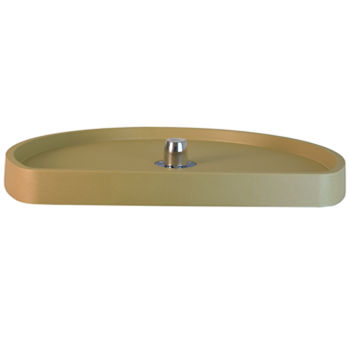 If you need parts for a lazy susan, OVIS stocks a large selection of Rev-A-Shelf lazy susan replacement parts for quick shipment to get your repair project completed quickly. Less common replacement parts can also be special ordered. We do not stock parts for the Rev-A-Shelf Value Line, or Lazy Daisy brands. Replacing individual parts makes a lot of sense both for your poketbook and the envrioment. However, if you need to repalce both shelves in your lazy susan, you're best off buying an new complete set and have all brand new parts. This saves money and time in the long run. Plus you can save any redundent parts for a future repair if necessary. Replacement shelf for Kidney Shape Rev-A-Tray. White. 18 Inch. Replacement for Series 6421. Replacement shelf for Kidney Shape Rev-A-Tray. Almond. 18 Inch. Replacement for Series 6421. Replacement shelf for Kidney Shape Rev-A-Tray. White 24 Inch. Replacement for Series 6421. Replacement shelf for Kidney Shape Rev-A-Tray. Almond. 24 Inch. Replacement for Series 6421. Replacement shelf for Kidney Shape Rev-A-Tray. White. 28 Inch. Replacement for Series 6421. Replacement shelf for Kidney Shape Rev-A-Shelf lazy susan. Almond. 28 Inch. Replacement for Series 6421. Replacement shelf for Dependently Rotating Full Circle Lazy Susan. White 18 Inch diameter. Replacement shelf for the 6012 Series Full Circle Shelf Set. Single Shelf Only and mounting hardware. Replacement shelf for Dependently Rotating Full Circle Lazy Susan. Almond 18 Inch diameter. Replacement shelf for the 6012 Series Full Circle Shelf Set. Single Shelf Only and mounting hardware. Replacement shelf for Dependently Rotating Full Circle Lazy Susan. White 20 Inch diameter. Replacement shelf for the 6012 Series Full Circle Shelf Set. Single Shelf Only and mounting hardware. Replacement shelf for Dependently Rotating Full Circle Lazy Susan. Almond 20 Inch diameter. Replacement shelf for the 6012 Series Full Circle Shelf Set. Single Shelf Only and mounting hardware. Replacement shelf for Dependently Rotating Full Circle Lazy Susan. White 24 Inch diameter. Replacement shelf for the 6012 Series Full Circle Shelf Set. Single Shelf Only and mounting hardware. Replacement shelf for Dependently Rotating Full Circle Lazy Susan. Almond, 24 Inch diameter. Replacement shelf for the 6012 Series Full Circle Shelf Set. Single Shelf Only and mounting hardware. Replacement shelf for Dependently Rotating Full Circle Lazy Susan. White 28 Inch diameter. Replacement shelf for the 6012 Series Full Circle Shelf Set. Single Shelf Only and mounting hardware. Replacement shelf for Dependently Rotating Full Circle Lazy Susan. Almond 28 Inch diameter. Replacement shelf for the 6012 Series Full Circle Shelf Set. Single Shelf Only and mounting hardware. Replacement shelf for Independently Rotating Full Circle Lazy Susan. White 16 Inch diameter. Replacement shelf for the 6072 Series Shelf Set. Single Shelf Only and mounting hardware. Replacement shelf for Independently Rotating Full Circle Lazy Susan. Almond 16 Inch diameter. Replacement shelf for the 6072 Series Shelf Set. Single Shelf Only and mounting hardware. Replacement shelf for Independently Rotating Full Circle Lazy Susan. White 18 Inch diameter. Replacement shelf for the 6072 Series Shelf Set. Single Shelf Only and mounting hardware. Replacement shelf for Independently Rotating Full Circle Lazy Susan. Almond 18 Inch diameter. Replacement shelf for the 6072 Series Shelf Set. Single Shelf Only and mounting hardware. Replacement shelf for Independently Rotating Full Circle Lazy Susan. White 20 Inch diameter. Replacement shelf for the 6072 Series Shelf Set. Single Shelf Only and mounting hardware. Replacement shelf for Independently Rotating Full Circle Lazy Susan. Almond 20 Inch diameter. Replacement shelf for the 6072 Series Shelf Set. Single Shelf Only and mounting hardware. Replacement SHELF, Independently Rotating Diagonal Base Cabinet Full Circle. White 24 Inch. Replacement Shelf for 6072 Series. Single Shelf Only. Replacement SHELF, Independently Rotating Diagonal Base Cabinet Full Circle. Almond 24 Inch. Replacement Shelf for 6072 Series. Single Shelf Only. Replacement SHELF, Independently Rotating Diagonal Base Cabinet Full Circle. Almond 28 Inch. Replacement Shelf for 6072 Series. Single Shelf Only. Replacement SHELF, Independently Rotating Diagonal Base Cabinet Full Circle. White 32 Inch. Replacement Shelf for 6072 Series. Single Shelf Only. Replacement SHELF, Independently Rotating Diagonal Base Cabinet Full Circle. Almond 32 Inch. Replacement Shelf for 6072 Series. Single Shelf Only. Replacement shelf for Dependently Rotating Pie-Cut Lazy Susan. White 18 Inch diameter. Replacement shelf for the 6142 Series Pie-Cut Shelf Set. Single Shelf Only and mounting hardware. Replacement shelf for Dependently Rotating Pie-Cut Lazy Susan. Almond 18 Inch diameter. Replacement shelf for the 6142 Series Shelf Set. Single Shelf Only and mounting hardware. Replacement shelf for Dependently Rotating Pie-Cut Lazy Susan. White 22 Inch diameter. Replacement shelf for the 6142 Series Shelf Set. Single Shelf Only and mounting hardware. Replacement shelf for Dependently Rotating Pie-Cut Lazy Susan. Almond 22 Inch diameter. Replacement shelf for the 6142 Series Shelf Set. Single Shelf Only and mounting hardware. Replacement shelf for Dependently Rotating Pie-Cut Lazy Susan.White 24 Inch diameter. Replacement shelf for the 6942 Series Shelf Set. Single Shelf Only and mounting hardware. Replacement shelf for Dependently Rotating Pie-Cut Lazy Susan. Almond 24 Inch diameter. Replacement shelf for the 6942 Series Shelf Set. Single Shelf Only and mounting hardware. Replacement shelf for Dependently Rotating Pie-Cut Lazy Susan. White 28 Inch diameter. Replacement shelf for the 6942 Series Shelf Set. Single Shelf Only and mounting hardware. Replacement shelf for Dependently Rotating Pie-Cut Lazy Susan .Almond 28 Inch diameter. Replacement shelf for the 6942 Series Shelf Set. Single Shelf Only and mounting hardware. Replacement shelf for D Shape lazy susan. White. 20 Inch. Replacement shelf for D Shape lazy susan. White. 22 Inch. Replacement shelf for D Shape lazy susan. Almond. 22 Inch. Positioner Base Assembly for Kidney Shelf. Replacement for Series 6272.